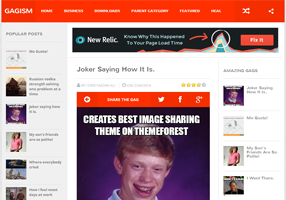 Gagism Responsive Blogger Template is based on Futuristic UI build for images gags websites. We have put together an amazing CMS interface for all those gag loving people who always desires to have a pictorial, or memes based site on Blogger platform. Most people find it difficult to start a gag site on WordPress due to fewer funds, but now they can have a professional gag site even on Blogger BlogSpot. Random Posts button, Rating system, Social buttons and lots of essential elements that were never seen before on a blogger site.